We’ve got new hoodies. Not just any old hoodies. 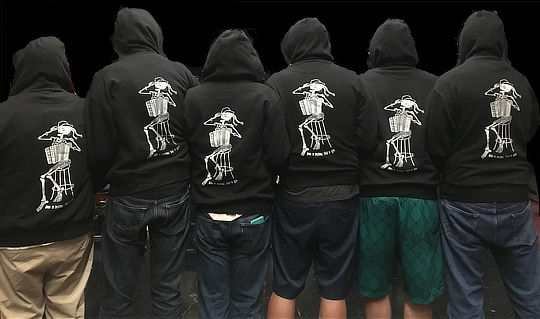 We’ve got glow-in-the-dark hoodies! Lucky Mule in Oakland silk-screened our “Calaca” design in glow-in-the-dark ink on the back of solid black, premium Cotton Heritage, unisex full-zip hoodies. So cool! These glow at night and look especially fantastic under UV light. 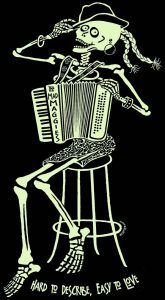 Perfect for accordion lovers, Calaca lovers, Halloween. Artwork is by Montréal artist Daniel Fiorito. 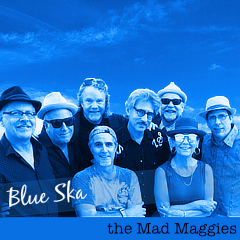 We’ll be selling them for $40 at our Lagunitas and Cotati shows. After that, if we have any left, they will be $45 plus shipping. calaca, Daniel Fiorito, hoodie, Lucky Mule, merch.